There was a small bounce in support for health care reform after the speech, but part of the effect dissipated. Meanwhile, estimated opposition to reform, which dipped in the wake of the speech, quickly rebounded toward previous levels and is now greater than it was before the speech. ….I’m emphasizing this point because there’s a misperception among journalists that the president can easily move public opinion. As we’ve seen again and again over the years, it’s simply not true, but the lack of followup by the press means that the lesson is never learned. I agree on the narrow question here: a single speech by a president probably has very little impact except in the very short term. But I’m not sure that’s the same thing as saying the presidents don’t have much effect on public opinion. It’s obviously harder to measure presidential impact the more broadly you look at it, but my guess is that presidents can have a fair amount of impact if they pick one or two subjects and hit on them early and often. This was one of my criticisms of Obama from the very beginning: his campaign was very good at inspiring people to vote for “change,” but that message was only good enough to win the election. By November 4th, the only specific change in most people’s minds when they entered the voting booth was that they didn’t want four more years of George W. Bush. Now, Job 1 in a campaign is to get elected. 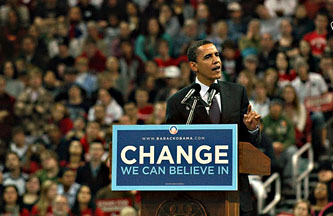 And “change” is one of the two classic messages for any winning campaign. (The other is “experience counts.”) But there’s not much point in getting elected unless you can accomplish something once you’re in the Oval Office, and that requires a public that’s solidly behind your legislative program. Unfortunately, that’s something Obama never really got, because he didn’t want to take the chance of muddying his message and risking the election. Maybe that was the right decision, but the end result is that he doesn’t really have a lot of genuinely fervent public support (the kind of support that generates townhall protests in every state, lights up the congressional swithcboard like a Christmas tree, and makes politicians fear for their reelection) for his specific healthcare agenda. It could be that there’s no way to square this circle. I don’t know. But I believe two things: (a) public opinion is the key to almost everything and (b) it’s hard for a president to move public opinion. One lesson you can take from that is that presidents are stuck. The other is that they should treat public opinion the way Eisenhower treated World War II and mount a long, hard campaign to win it from their earliest days on the campaign trail. I choose door #2.